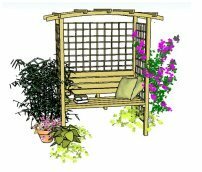 The garden suppliers listed below provide a wide range of products; some specialising in a particular type of item, such as garden structures, pond equipment etc. ; others having a wider range of landscaping products for sale. Be sure to look out for bargains, which can be both seasonal and out-of-season offers. Some of these you can find quickly by going to my Fantastic Offers page. When buying for my design business, I have used many of these companies. Each one has its own strengths, either in a particular range of items it supplies, or because it is very cost effective. Do look out for the gems that can be found on what we might consider bargain sites, where the product is great quality only for a fraction of the price you might expect to pay! This fabulous site invariably has the cheapest garden buildings when compared with other suppliers, with lots of variety and great prices. Really worth a look if you are thinking of buying a pergola or arch. 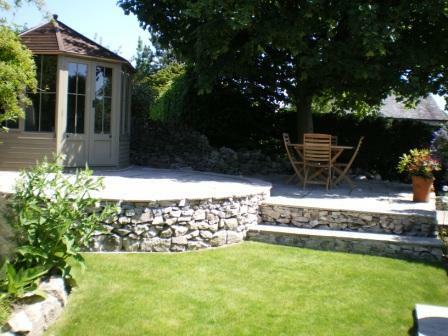 Also supply stone patio kits. A wide range of garden buildings. Look under 'Garden Structures' for pergolas arches and arbours. 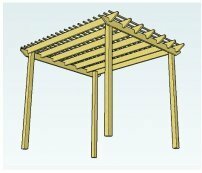 The 'Decking' section has pergola and deck combinations, and corner pergola with deck. They sell by far the best range of metal pergolas and arches. Greenfingers has an extensive range of traditional and contemporary garden furniture complemented by innovative and decorative accessories : solar lighting & water features as well as composters, water butts, wooden sheds and plastic tool-stores. 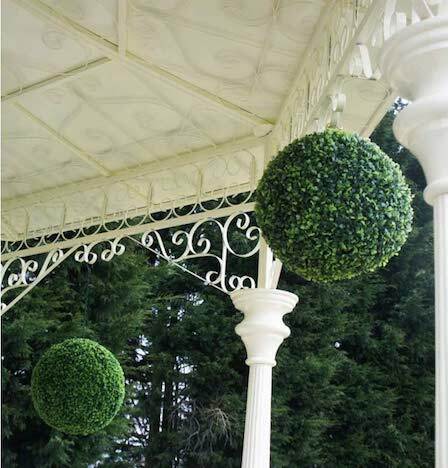 Sell intereting and unusual metal pergolas and gazebos in powder-coated steel, which means the frame will stay free from rust. Plenty of awnings and fabric covered gazebos. If it's a long metal pergola climbing-rose walkway your after, then this is the place to find it. They have several designs available. The pergola kits they sell are good quality pergola and decking kits. The decking can be found separately. Good value garden products. Availability tends to be seasonal but can get great bargains. Some items can be very stylish, much more so than their price suggests! 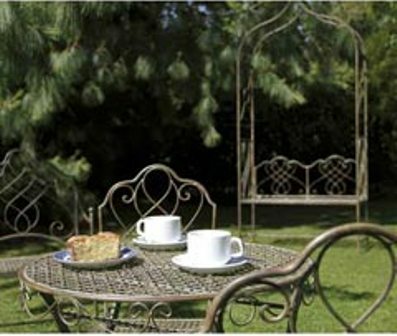 See 'Garden Furniture' section for seated arbours, fabric gazebos and pergolas. Sells sheds, of course, and some great pergola deck kits, arbours and pergola swinging seats, all at discount prices. 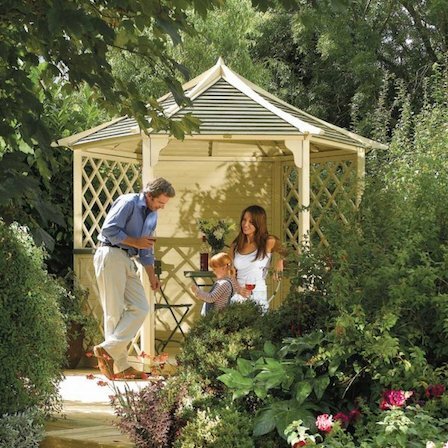 Find a great selection of stylish cedar gazebos to decorate your garden and live your life in style with your family and friends. 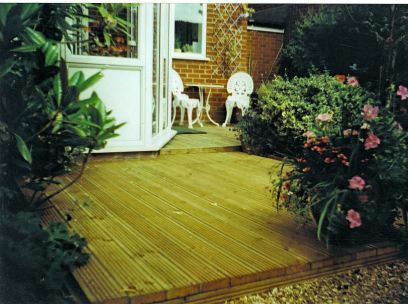 Suppliers and installers of vinyl decking, fencing and nearlygrass products: for the low maintenance option. 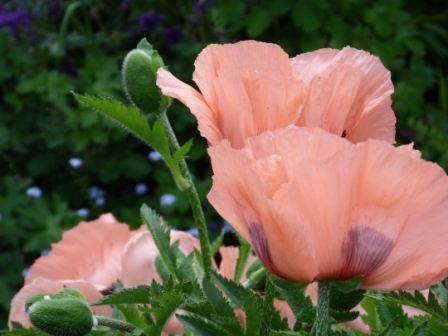 Excellent online plant sales, with a wealth of advice. Good plant information on height, spread, care and maintenance. Rolawn is Europe’s largest producer of cultivated turf and is also recognised as Britain’s leading supplier of safe, certified high quality topsoil. The Rolawn brand is the recognised benchmark of quality and service, with a reputation having been established over 30 years. Garden suppliers who sell a fabulous range of plants online by mail order, having many 'grow your own' fruit and vegetable offers. Very well-established online plant seller. Excellent prices, and some big saving to be made, especially on their 'Plants of the Week' and their 'Deal of the Day'. Established since 1850, Thompson and Morgan are garden suppliers of quality plants, seed and garden sundries, with an extensive range of 'grow your own' fruit and vegetables. Find the Alan Titchmarsh Collection here. A long established company who supply a full range of flower and vegetable seeds, bulbs, fruit, plus annual and perennial plug plants for pots, patios and all around the garden, delivered by mail order and through their website. Excellent prices, even beating traders discount prices by several hundreds of pounds for a standard patio! Inclusive of VAT and free delivery. Well worth a look, with galeries to help you decide. For quality garden furniture and accessories, especially good for all weather rattan. 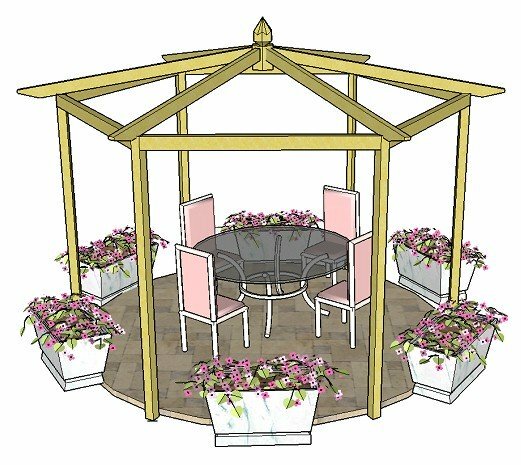 Garden suppliers who stock a good selection of garden structures, garden furniture and accessories at very affordable prices. Find some really great deals on garden landscaping and accessories. Keep a look out for offers. Have slightly out of the ordinary products such as 'easy deck bearers' that can make jobs easier to complete. 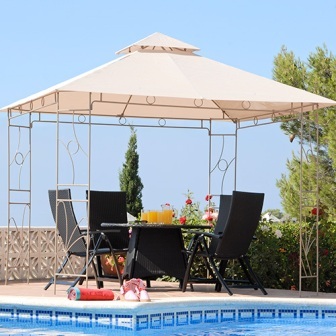 They have all the usual DIY products and also pergolas, gazeboes and arches. Specialists in fruit cages, plant supports and anything to do with propogation of plants. They sell raised beds in many different sizes. 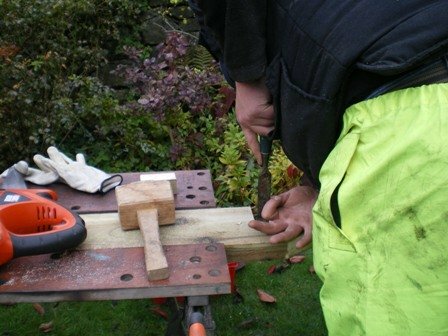 Keen Gardener is a friendly, family run company where service and quality still really matter. 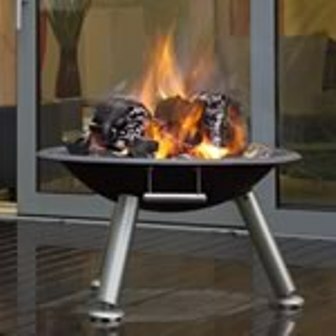 They are garden suppliers of high quality, reliable, long-lasting and great value for money gardening and BBQ products. Garden suppliers specialising in greenhouse and garden equipment. For more unusual products, some sleek and stylish, others fun and funky. Wonderful garden furniture and accessories, including outdoor beanbags, hanging chairs, firepits, hammocks, sleek sun loungers, and lots more! Great value, quality tools and equipment and every conceivable tool. Generally sell like-for-like products at the cheapest prices. Sells tools and accessories. Look out for the bargains. 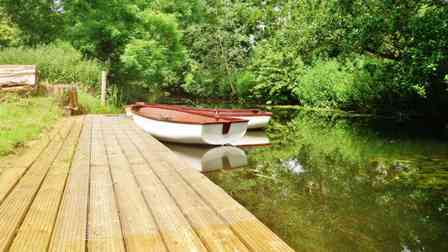 Find a huge range of quality wood finishing products for any project. including wood oils, waxes, stains, varnishes and fillers, along with related accessories such as brushes, glues, abrasives and protective clothing. Do you need tools especially for left-handed people? This is the place to find a whole range of products to make your life easier! - including gardening tools. 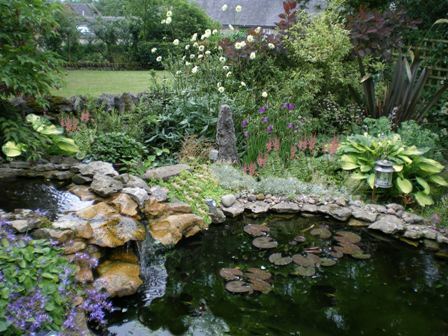 A wonderful resource for all your pond needs. One of the largest garden centres in Colchester, offering a range of attractions, including rowing on the River Colne, an Aquatics and Pet Centre that the kids will love and a great coffee shop, Mill Race Garden Centre is also an online supplier of a wide range of reasonably priced garden accessories, tools and aquatic equipment. Check out their very interesting and informative blog pages.